Docker Enterprise Edition(EE) 2.0 Final GA release is available. One of the most promising feature announced with this release includes Kubernetes integration as an optional orchestration solution, running side-by-side with Docker Swarm. Not only this, this release includes Swarm Layer 7 routing improvements, Registry image mirroring, Kubernetes integration to Docker Trusted Registry & Kubernetes integration to Docker EE access controls. With this new release, organizations will be able to deploy applications with either Swarm or fully-conformant Kubernetes while maintaining the consistent developer-to-IT workflow. 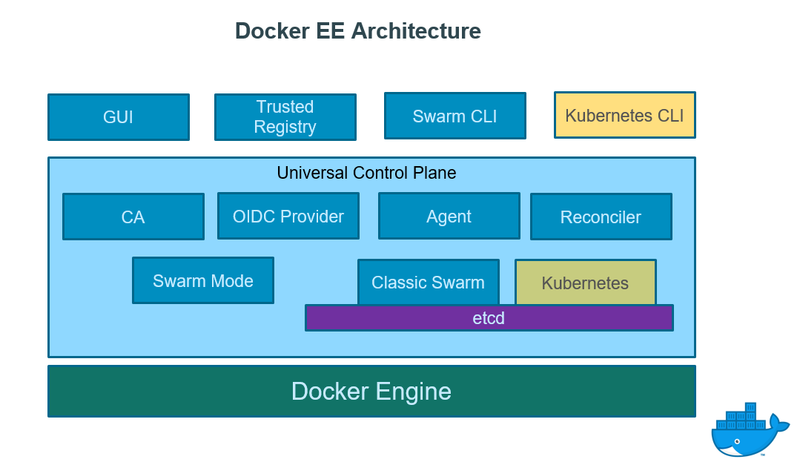 Docker EE is more than just a container orchestration solution; it is a full lifecycle management solution for the modernization of traditional applications and microservices across a broad set of infrastructure platforms. It is a Containers-as-a-Service(CaaS) platform for IT that manages and secures diverse applications across disparate infrastructure, both on-premises and in the cloud. Docker EE provides an integrated, tested and certified platform for apps running on enterprise Linux or Windows operating systems and Cloud providers. It is tightly integrated to the underlying infrastructure to provide a native, easy to install experience and an optimized Docker environment. Docker EE 2.0 GA consists of 3 major components which together enable a full software supply chain, from image creation, to secure image storage, to secure image deployment. Universal Control Plane 3.0.0 (application and cluster management) – Deploys applications from images, by managing orchestrators, like Kubernetes and Swarm. UCP is designed for high availability (HA). You can join multiple UCP manager nodes to the cluster, and if one manager node fails, another takes its place automatically without impact to the cluster. EE Engine 17.06.2- The commercially supported Docker engine for creating images and running them in Docker containers. 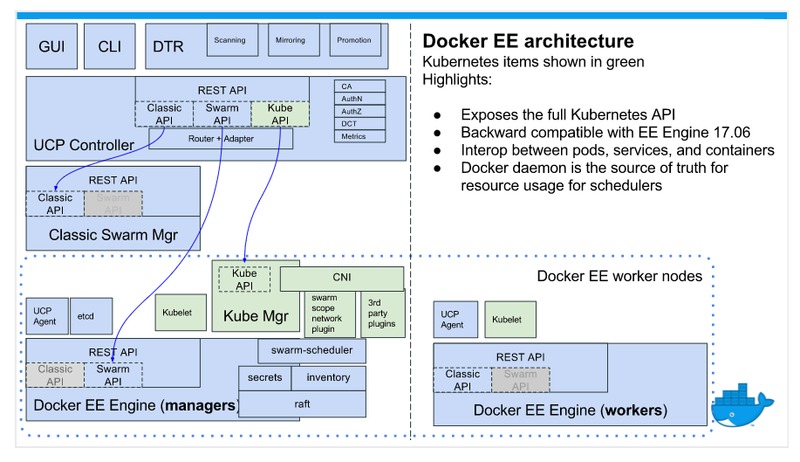 Tell me more about Kubernetes Support..
Kubernetes in Docker EE fully supports all Docker EE features, including role-based access control, LDAP/AD integration, scanning, signing enforcement, and security policies. Interoperability between Swarm and Kubernetes workloads for networking and storage. But wait.. What type of workload shall I run on K8s and what on Swarm? One of the question raised multiple times in last couple of Docker Meetup was – Good that now we have K8s and Swarm as multi-orchestrator under the single Enterprise Engine. But what type of workload shall I run on Kubernetes and what on Docker Swarm? 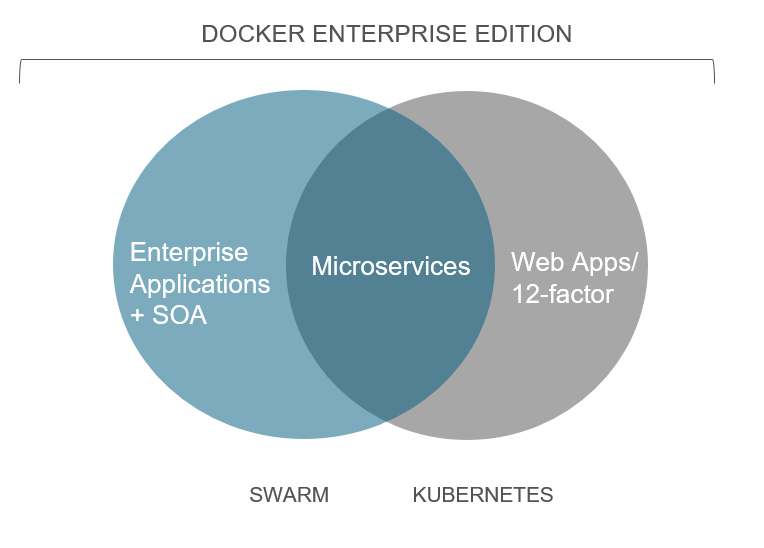 As shown above, even though there is a bigger overlap in terms of Microservices, Docker Inc. recommends specific types of workloads for both Swarm and Kubernetes. Kubernetes works really great for large-scale workloads. It is designed to address some of the difficulties that are inherent in managing large-scale containerized environments. Example: blue-green deployments on Cloud Platform, highly resilient infrastructure with zero downtime deployment capabilities, automatic rollback, scaling, and self-healing of containers (which consists of auto-placement, auto-restart, auto-replication , and scaling of containers on the basis of CPU usage). Hence, it can be used in a variety of scenarios, from simple ones like running WordPress instances on Kubernetes, to scaling Jenkins machines, to secure deployments with thousands of nodes. Docker Swarm, on the other hand, do provide most of the functionality which Kubernetes provides today. With notable features like easy & fast to install & configure, quick container deployment and scaling even in very large clusters, high availability through container replication and service redundancy, automated internal load balancing, process scheduling, Automatically configured TLS authentication and container networking, service discovery, routing mesh etc. Docker Swarm is best suited for MTA program – modernizing your traditional legacy application(.Net app running on Windows Server 2016) by containerization on Docker Enterprise Edition. By doing this, you reduce the total resource requirements to run your application. This increases operational efficiency and allows you to consolidate your infrastructure. 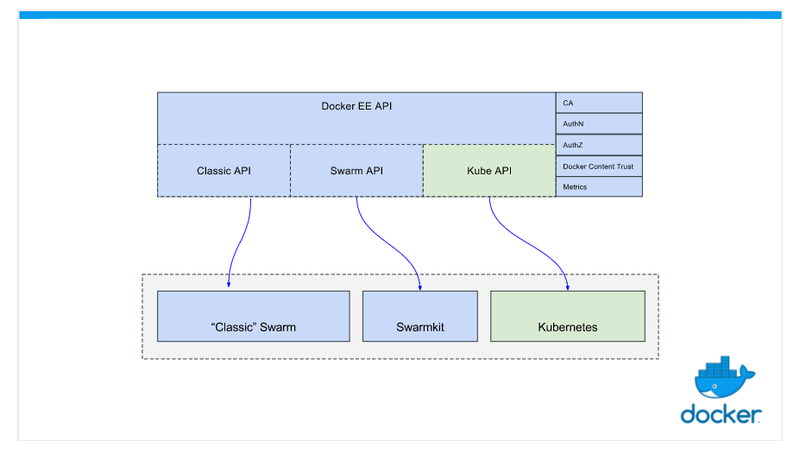 Under this blog post, I will deep dive into Docker EE Architecture covering its individual components, how they work together and how the platform manages containers. At the base of the architecture, we have Docker Enterprise Engine. 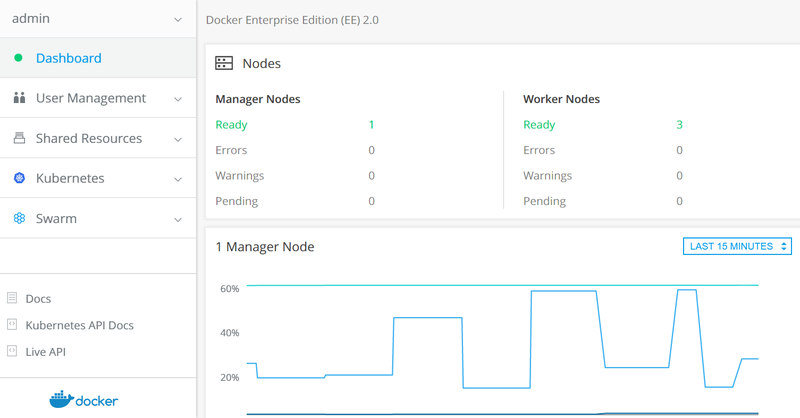 All the nodes in the cluster runs Docker Enterprise Edition as the base engine. Currently the stable release is 17.06 EE. It is a lightweight and powerful containerization technology combined with a work flow for building and containerizing your applications. Sitting on top of the Docker Engine is what we call “Enterprise Edition Stack” where all of these components run as containers(shown below in the picture), except Swarm Mode. Swarm Mode is integrated into Docker Engine and you can turn it on/off based on your choice.Swarm Mode is enabled when Universal Control Plane (UCP) is up & running. In case you’re new to UCP, Docker Universal Control Plane is a solution designed to deploy, manage and scale Dockerized applications and infrastructure. As a Docker native solution, full support for the Docker API ensures seamless transition of your app from development to test to production – no code changes required, support for the Docker tool-set and compatibility with the Docker ecosystem. 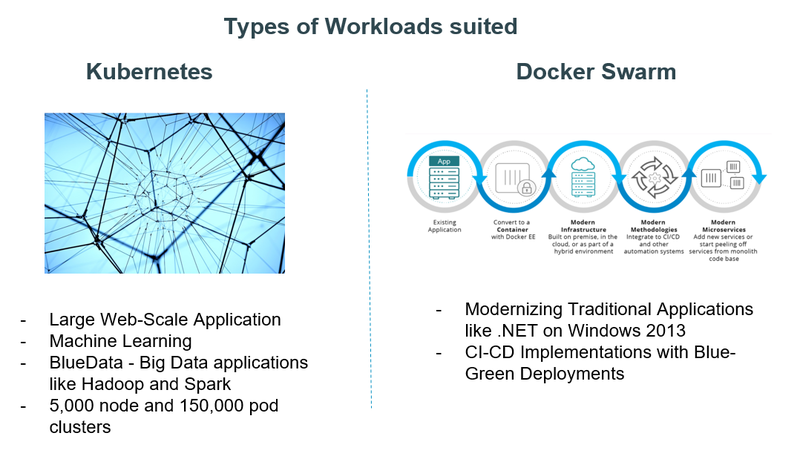 There are 3 orchestrators sitting on top of Docker Enterprise Engine – Docker Swarm Mode, Classic Swarm & Kubernetes. For both Classic Swarm and Kubernetes, there is the same underlying etcd instance which is highly available based on setup you have in your cluster. Docker EE proxies the underlying API of each orchestrator, giving you access to all of the capabilities of each orchestrator, along with the benefits of Docker EE, like role-based access control and Docker Content Trust. To manage lifecycle of orchestrator, we have a component called Agents and reconciler which manages both the promotion and demotion flows as well as certification renewal rotation and deal with patching and upgrading. Agent is the core component of UCP and is a globally-scheduled service. When you install UCP on a node, or join a node to a swarm that’s being managed by UCP, the agent service starts running on that node. Once this service is running, it deploys containers with other UCP components, and it ensures they keep running. The UCP components that are deployed on a node depend on whether the node is a manager or a worker. In nutshell, it monitors the node and ensures the right UCP services are running. Another important component is Reconciler. When UCP agent detects that the node is not running the right UCP components, it starts the reconciler container to converge the node to its desired state. It is expected for the UCP reconciler container to remain in an exited state when the node is healthy. In order to integrate with K8s and support authentication, Docker Team built open ID connect provider. In case you’re completely new to OIDC, OpenID Connect is a simple identity layer on top of the OAuth 2.0 protocol. It allows Clients to verify the identity of the End-User based on the authentication performed by an Authorization Server, as well as to obtain basic profile information about the End-User in an inter-operable and REST-like manner. As Swarm Mode is designed, we have central certificate authority that manages all the certificates and cryptographic node identity of the cluster. All component uses mutual TLS communication and they are using nodes which are issue by certificate authority. We are using unmodified version of Kubernetes. Sitting on the top of the stack, there is GUI which uses Swarm APIs and Kubernetes APIs. Right next to GUI, we have Docker Trusted Registry which is an enterprise-ready on-premises service for storing, distributing and securing images. It gives enterprises the ability to ensure secure collaboration between developers and sysadmins to build, ship and run applications. Finally we have Docker & Kubernetes CLI capability integrated. Please note that this uses un-modified version of Kubernetes API.